Nxai Pan Camp offers comfortable accommodation that is in stark contrast to the arid surroundings of the Makgadikgadi Pans and Central Kalahari area of Botswana. 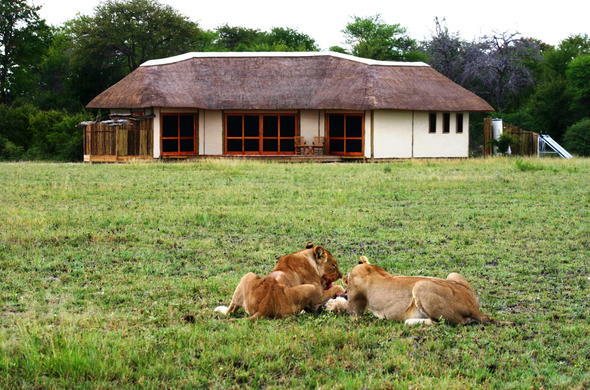 Nxai Pan Camp is a safari lodge situated on the edge of a fossil pan in Nxai Pan National Park. The camp has sweeping views over the open grasslands of the pan. The camp accommodates a maximum of 18 guests in 9 thatched chalets that have been built with environmental principles in mind. This means that they hold a comfortable temperature throughout the year, although the outside temperature may vary hugely. This safari lodge in the Nxai Pan National Park is situated up in the tree line and overlooks a well frequented waterhole. The reception rooms consist of a spacious dining room and lounge area that opens out onto a wide deck that has sweeping views across the open grasslands. The waterhole and grasslands attract large numbers of wildlife and excellent game viewing is possible from the comfort of your room. While staying at Nxai Pan Camp you will explore the region on morning and evening game drives, interpretive bush walks with Bushmen trackers and learn about the stars on star gazing expeditions. The region is also known for its large groups of Giraffe, with groups containing as many as 30 animals regularly seen. The famous painter Thomas Baines painted a group of baobabs on the edge of the pan in 1861 and they have since become one of the iconic landmarks in the region that many travellers visit.